“Fun to be seen driving” are the words used by TopGear to describe the VW Beetle. Having driven one for the best part of two and a half years, I would add that indeed, it is possibly more fun to be seen driving a Beetle than it is in fact driving a Beetle. Not that I didn’t love every minute of being said driver of my particularly iridescent sapphire specimen. I bought my Beetle in the summer of 2012 as my ultimate, single girl-about-town classy set of wheels, despite being a) not actually single and b) far too terrified to actually drive it anywhere about my town – being London at the time – except out, via the south circular, to work. But man, did I love being the girl driving the Beetle. Pedestrians would stare enviously (or so I choose to interpret) as they hastily retracted their toes from the zebra crossing, other Beetle owners waved, and car washers would chuckle and mock the little fake flower in the test tube vase next to the steering wheel. Around six months after I bought my Beetle, I got pregnant. Approximately seven and a half months later, upon receiving ownership of a fairly standard-sized travel system pushchair, I discovered just how incompatible this car is with family life. Even without a seat, the frame simply did not fit in the bloody boot. I had to take the two back wheels off. Every. Single. Time. If that wasn’t enough, I of course had gone for the three door, four seat version in a pique of I’m-only-25-I’m-not-even-thinking-of-having-kids-yet logic. This made getting baby + car seat in and out PARTICULARLY FUN. I’m not even going to talk about the beige interior. Suffice to say it doesn’t meld well with babies, or any of the items said creatures ingest and… yeah. It was also around this time – being the summer of 2013 – that I realised my most heinous oversight at the time of purchase. The car did not have air conditioning. Yes, it had heated seats and a standard heating system which made it a particularly cosy drive in the winter, and I hadn’t really noticed the lack of AC too much the summer before, when I’d been a svelte size 8-10 with thighs that didn’t rub together and was still in Beetle honeymoon period. But, two stones bigger and with a new, 120mile round commute to and from work, the novelty of my Beetle ownership wore off around the time I heaved myself into the driver’s seat ahead of a two hour jaunt on the m25 and saw the car’s thermometer merrily reading 40 degrees. The sweat just went everywhere. It was then I had my Roy Scheider moment. I was going to need a bigger car. Sure, I wasn’t going to get eaten by a shark if I didn’t, but having any more babies invoked images of driving along with the boot duck-taped half open over one buggy while I towed the other along behind me. Besides, I was sick of having to climb into the back seat – even with the time-perfected twist, stoop and pivot – every time I needed to get my increasingly large Lara in and out. The mileage was still decent, paintwork fairly spotless, age not bad and I had six months on the MOT. You will be pleased to know that though I am silly enough to sacrifice any serious offers of purchase for cheap Facebook LOLs by posting a light-hearted advert including the word sh!t in the description, I’m not quite so stupid that I would make this blog post live before keys changed hands. Therefore, I am happy to announce that the Beetle has gone *pang* and I am now the proud owner of its much more sensible, much more bigger brother, the VW Tiguan. 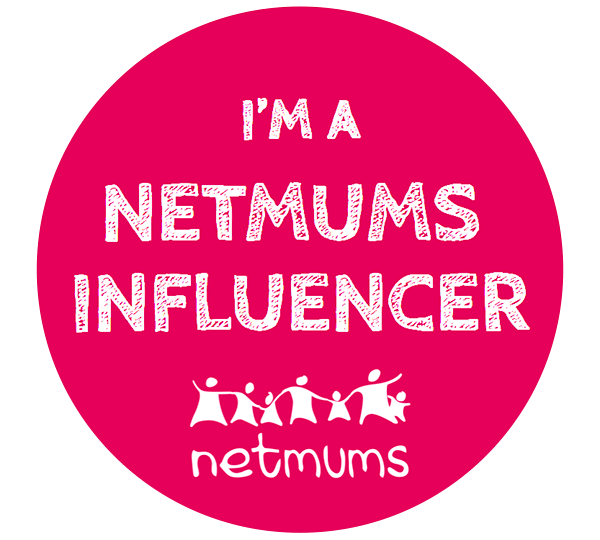 The drive is noisier, the diesel more expensive and I am now one of those SUV mums, but the other day I managed to get BOTH buggies and a suitcase into the boot without obstructing any vision out the back window. I guess that girl about town grew up. And got really boring. 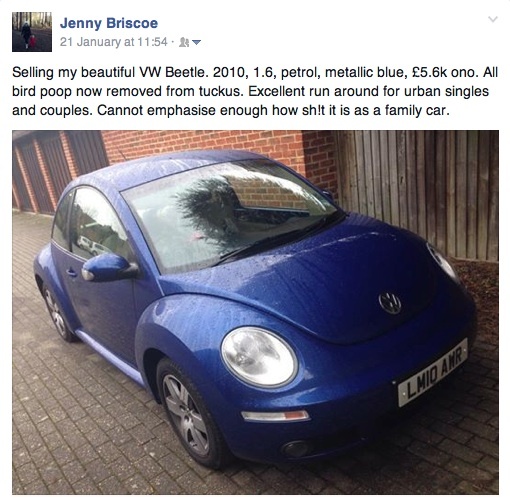 This entry was posted on Friday, February 6th, 2015 at 11:42 am	and tagged with can't fit buggy in car, car too small, driving alone with baby, driving beetle pregnant, driving unsuitable car with baby, driving vw beetle, driving with a baby, driving with baby, i hate my beetle, i love my beetle, pregnancy and driving vw beetle and posted in a pregnant journalist, babies, baby on the go, bad driving, bad family car, being a parent, dangerous driving, driving, driving with a baby, having a baby, impractical car for family, mess, mummy driving, parenthood, perfectly safe driving, pregnancy, road rage, shopping with baby, Stay at home mum, Thighs, travelling alone with a baby, unexpected pregnancy, vw beetle, Working mum. You can follow any responses to this entry through the RSS 2.0 feed.